'Temple, Udaipur' was included in the 2002 Dobell Prize (entry no. 298). 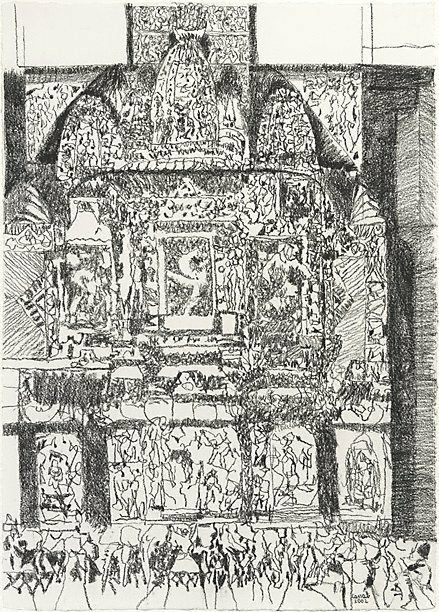 The subject of the drawing is a temple Judy Cassab saw on a visit to India in February 2002. The temple complex (Eklingji Temple, at Kailashpuri) is 12 miles north of Udaipur in Rajasthan. It is dedicated to the deity Eklingji (Shiva), and also includes temples to other deities. Judy Cassab has kept a diary her whole life; on this visit she began, for the first time, to illustrate it; she also drew in a number of sketchbooks (artist's collection). One of these small illustrations was the basis for this drawing. This work was a finalist in the 2002 Dobell Prize and was acquired by the Gallery in 2003. Signed and dated l.r. corner, charcoal "Cassab/ 2002".